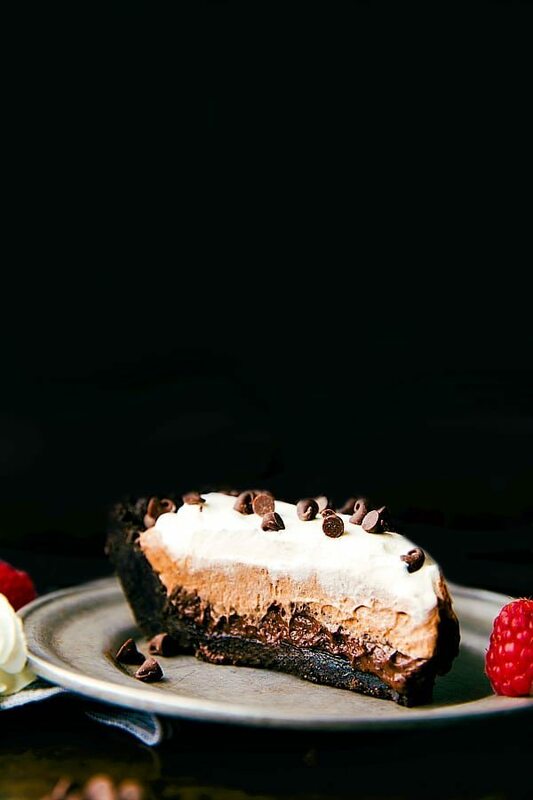 A six-ingredient easy triple-layer chocolate pudding pie. 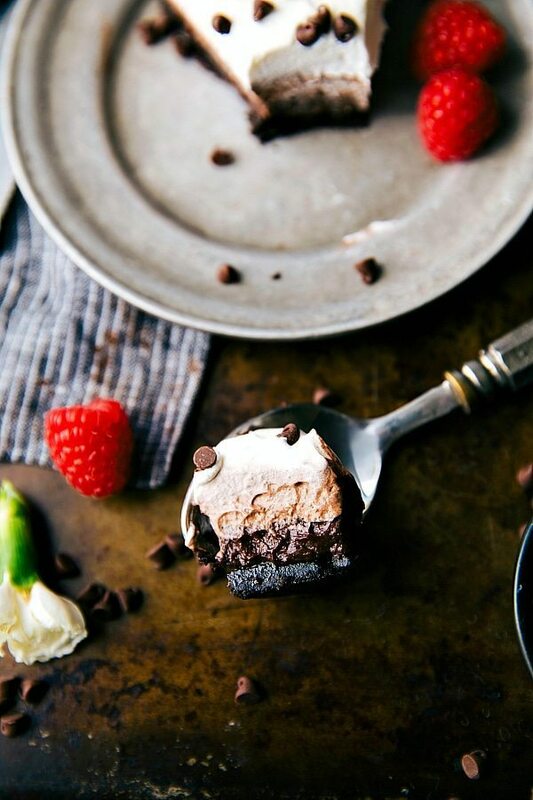 A dessert dressed to impress with minimal effort. Perfect for a potluck or holiday celebrations! 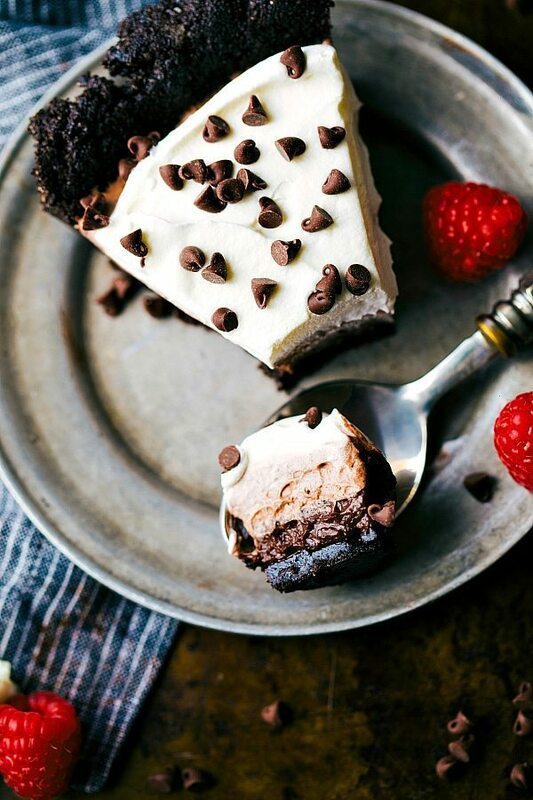 This chocolate pudding pie only requires six ingredients! Hey everyone! How was your weekend? I spent the weekend eating my way through Portland, Oregon at a blogging conference. I had such a great time, but seriously missed my boys (all three of them!) like crazy. I was finally able to try Portland’s famous Voodoo donuts. They are quite the treat covered in all kinds of crushed candy and cereals. I’d never seen so many unique types of donuts and along with seeing so many I don’t think I’ve ever eaten so many donuts in one day either. ? While in Portland though you’ve got to take advantage right?! To make it up to the boys for leaving for a weekend, I made them this easy chocolate pudding pie. Since I rarely travel, I didn’t have time for anything too elaborate after the ridiculous amount of time spent in indecisive packing. Aaaand knowing that one of the husband and toddler’s favorite treats is chocolate pudding, this creation took place. It may look elaborate or time consuming with the three different layers, but it couldn’t be easier to make. All three layers originate from just THREE ingredients. Pudding mix, milk, and whipped topping = best ever chocolate pudding pie. The magic happens in mixing those three layers in different amounts. The bottom layer is the straight chocolate pudding, the middle layer is pudding + whipped topping mixed, and the final layer is straight whipped topping. And voila! 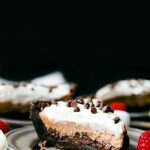 Easy chocolate pudding pie for the win! 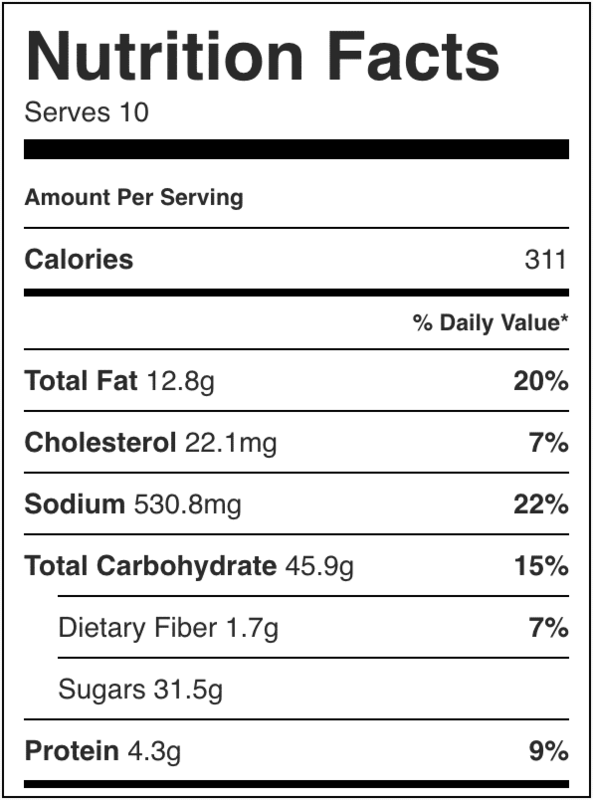 Unfortunately low fat products aren’t going to set up in this pie. Sugar-free pudding or sugar-free whipped topping is a no-go. They never get firm enough to get clean cuts of pie. Speaking of “cuts” I found the best results with an extremely sharp knife that I quickly ran under hot water, dried, and then cut into the pie immediately. The reason I recommend using whole milk is because it will allow for the most firm set up of the pie. Lower the percentage of fat in milk and the less firm of a pie you’ll get. If you want an even easier pudding pie you can grab a pre-made chocolate crust on the baking aisle instead of making your own. I used pre-made packaged whipped topping, but making your own whipped topping absolutely will work in this pie. It takes a little bit more prep and a few more ingredients (I’d whip heavy whipping cream with a few tablespoons powdered sugar and some vanilla), but it works great! Blend or pulse the oreos (no need to remove the filling) until they resemble fine crumbs. Mix the crumbs with the sugar (only if desired and you like a really sweet dessert!) and melted butter (start with 6 tablespoons and add 1 more tablespoon if it isn't coming together enough). Spray a pie pan (I use a 9-inch) with nonstick spray and press the cookie crust evenly along the bottom and slightly up the sides. Place in freezer while preparing the filling. Briskly whisk the 2 packages of instant pudding mix with the cold milk and whisk for 2 minutes. Remove 1 and 1/2 cups of the pudding and place in the bottom of the cookie crust. Spread evenly. Combine the remaining pudding with half of the whipped topping and spread evenly on top of the chocolate pudding. With a clean spatula, spread the remaining whipped topping evenly on top. If desired sprinkle mini chocolate chips on top. When ready to serve, warm a very sharp knife under hot water, dry, and then make quick clean cuts to serve. If desired, serve with fresh raspberries. Portland is my FAVORITE! 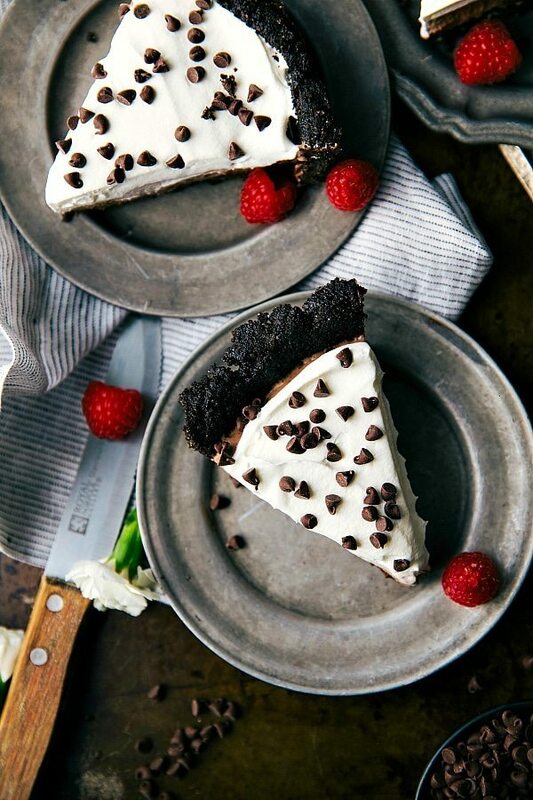 I would be glad to have this pie! It was so fun to go there!! Wish I could send you some 😉 Thank you so much Julianne! Awe thank you so much Medha! 🙂 I appreciate it! So many things to love about this recipe, Chelsea! I think my favorite is all of that chocolate! It looks amazing, and I’m craving a generous slice for myself! Awe thank you so much Sam!! Wish I could send you a piece! Yes yes yes to this pie! Looks AMAZING. Hi Chelsea, This pie looks delicious and I have made something like it but I was just wondering if 2 cups of milk is enough for the 2 pie pkgs. My son is making his confirmation this week and this is something he would love. p.s. I saw this recipe on Sallys baking addiction. Hey Lisa! Great to hear from you 🙂 The milk amount is definitely correct — there is a lot less milk than regular pudding so it is able to set up correctly. I hope your son loves it! Oh my word! I made the mistake of only buying enough for one pie and I’m giving it to someone else… guess I’ll be buying more tomorrow to make one for myself! This was insanely easy and SO SO chocolatey!